Charter flights for you to follow the Iditarod from start to finish. One of the questions we are often asked is "How can I best see the Iditarod?" Iditarod tour flights are the best way to see this great event. Sheldon offers full Iditarod race following air support, from the first checkpoints at Puntilla Lake and Rainy Pass, all the way to Nome for the hardy adventurer. An Iditarod flight is the adventure of a lifetime, and it's the one way to fully appreciate the last great race. 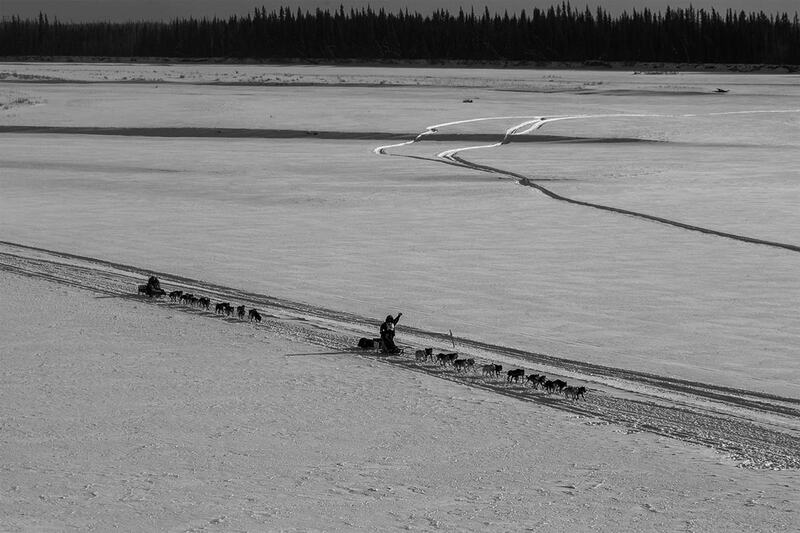 More than just a test of endurance and speed, the Iditarod is like a chess game played on a board of a thousand miles of wilderness. 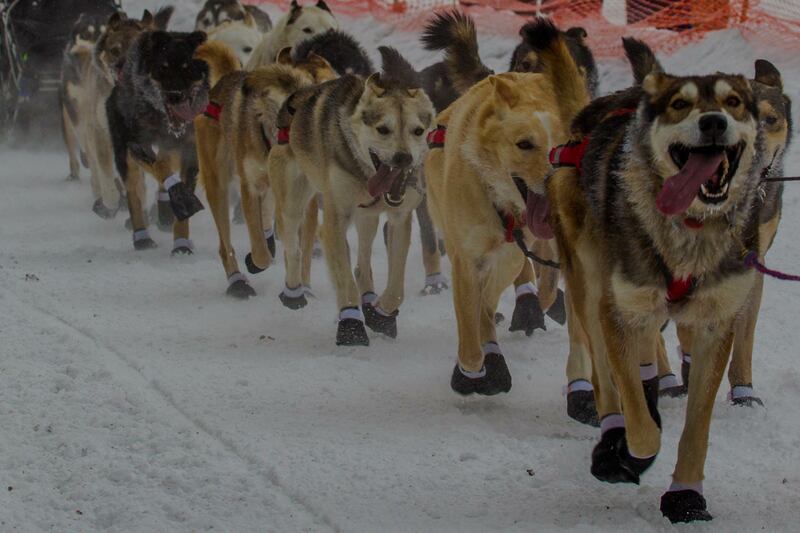 Sheldon Air Service can customize your tour as the race plays out - putting you right where you need to be to witness first hand the strategic and often dramatic moves the race leaders make as they duel to the finish line in Nome. Sheldon Air Service also offers an exclusive Day Trip from Talkeetna to the historic Puntilla Lake checkpoint with lunch at the Rainy Pass Lodge. This is an excellent way to view the leading mushers on the Iditarod trail. Seats are still available, see the bottom of this page for details. Sheldon also offers full Iditarod race following tour air support, from the first checkpoints at Puntilla Lake and Rainy Pass all the way to Nome for the hardy adventurer. Contact Sheldon at 1-907-733-2321 or info@sheldonairservice.com. 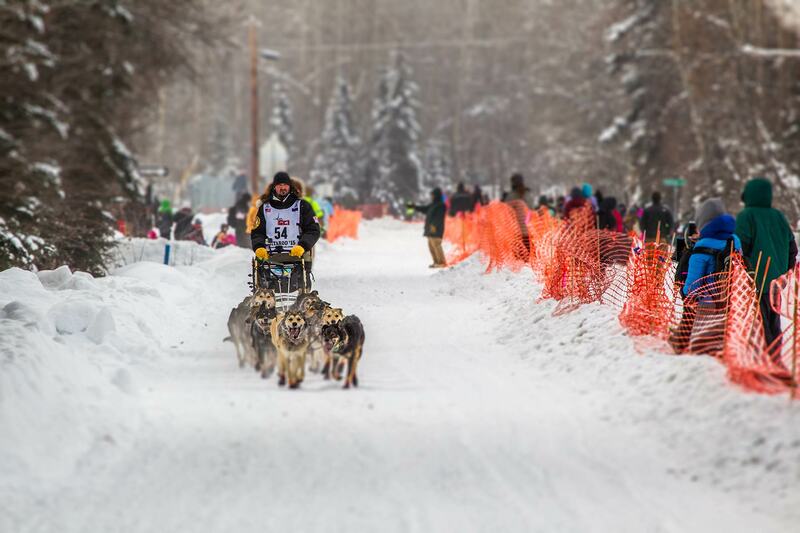 In early March, when the most brutal aspects of the arctic winter begin to subside, and before warming temperatures degrade the race trail, an epic sporting event takes place across the breadth of Alaska. The Iditarod was first run in 1973, but was largely unknown outside Alaska, until 1985, when Libby Riddles made a daring move into a fierce coastal blizzard and became the first woman to win. The following year, 1986, Susan Butcher became the second woman to win the Iditarod. Butcher went on to rack up an enviable record in any sport, becoming the second four-time winner in 1990 and the first musher ever to win four out of five sequential runnings of the epic race. She is commemorated by Alaskans on Susan Butcher Day. Through her accomplishments the race came to national attention in the early '90's. This is only fitting, as gender distinctions in Alaska are not what they are ''Outside'',- the euphemism Alaskans use to describe the other 49 states. Women maintain a coequal status in our state, due to the self-selecting nature of those who chose to live here, and the profound challenge of living in a vast expanse of raw, largely untamed nature. The crown jewel of Alaskan winter sports, the running of the Iditarod from Anchorage to Nome, which will begin with a ceremonial start at the intersection of Fourth Avenue and D street in downtown Anchorage, on Saturday March 3rd, 2018. The race begins in earnest with the restart in Willow the following day. From there, up to 80 teams of Iditarod mushers including veterans such as Martin Buser, DeeDee Jonrowe, Jeff King, Lance Mackey, Hugh Neff, Mitch Seavey and Aliy Zirkle, and defending champion Dallas Seavey, among many others, face close to 1000 miles of arctic wilderness, two mountain ranges, forbidding weather and intense competition on the way to Nome. To get a feel for the view from the runners of an Iditarod dog team, have a look at this video by Aliy Zirkle as she and her team descend the notorious Happy River Steps in the Alaska Range. But Iditarod sled dog racing is something that cannot really be conveyed by televised and online coverage. To fully appreciate the Iditarod, one must follow the action in the environment, see the vast distances involved, and observe the mushers rest and refuel at a checkpoint before mushing on into the vastness. And the energy and spirit of sled dogs must be experienced to be believed! Sheldon Air Service offers two unique ways to experience the Iditarod in an unforgettable manner. For those who want the flavor of the racing without the duration, a day trip from Talkeetna to Rainy Pass Lodge checkpoint will provide a breathtaking aerial view of the course and a day full of close observation of the race at the Rainy Pass checkpoint. Rainy Pass is one of the early obstacles in the complex course. The Pass is part of the Historic Iditarod Trail, but until 1976 the pass was inaccessible and the route detoured through Ptarmigan Pass, also known as Hellsgate. From Skwentna, the route follows the Skwentna River into the southern part of the Alaska Range to Finger Lake. The stretch from Finger Lake to Rainy Pass, on Puntilla Lake, is among the most dangerous in the Iditarod, as the teams follow the narrow Happy River Gorge, where the trail balances on the side of a heavily forested incline. For those who want a once-in-a-lifetime look at the Iditarod, Sheldon can provide a complete Iditarod race-following adventure. Iditarod sled dog racing can be strewn across hundreds of miles of arctic wilderness as the race ensues. The only way to fully experience the Iditarod first hand (short of training for a year and running a team) is to utilize that other legend of Alaska transportation, the ski-equipped bush plane. For those who can afford the ultimate Iditarod race-following experience, Sheldon can tailor the expedition to your needs. However, there are implications. If your Iditarod race-following team wishes to take advantage of the quality accommodations available at selected locations along the route, a full load of 6 passengers in the DeHavilland Beaver or 4 passengers in the Cessna 185 can be transported along the route. If your hardy band of Iditarod race followers want to get the full experience and camp along the way, contact Sheldon Air Service with your team requirements and discuss with our experienced staff the amount of gear required to sustain an adventure team enroute. Weight limits will require a trade-off between gear and passengers. A smaller team with more gear might be more realistic for those who want to reach out and touch Alaska. Either way, your corporate team-building or ultimate bucket-list buddy road trip can count on the same thing: The most experienced, capable air support for Iditarod race following that any amount of money can buy. Dave Lee, Director of Flight Operations for Sheldon Air Service, has 14 years of Iditarod race-following flight in his logbook. No one knows the Iditarod course as well as Dave Lee. From Anchorage to Nome, as the race unfolds, Dave Lee and Jok Bondurant will put your adventure team at the right place at the right time â€weather permittingâ€ to witness the last great race on earth in no uncertain terms. The 2019 Puntilla Lake Day trip is scheduled for Monday, March 4th, 2019. By then, early race leaders will have arrived at the Iditarod's Puntilla Lake checkpoint and the trail will be full of the pack chasing them from Willow. You will be able to watch a steady stream of Iditarod mushers come into the Puntilla Lake checkpoint. You will have lunch at Rainy Pass Lodge and return to Talkeetna by 3 p.m.- 4 p.m. Pack warm gear, sunglasses, a snack, and bring your camera. After departure from Talkeetna at 11 a.m. we fly you towards Rainy Pass, through the Alaska Range where you will have a great chance to view mushers on the trail and see moose, trapper cabins, expansive rivers, frozen lakes and the grandeur of the Alaska Range. Call our office to reserve your seat as this flight offering is on a space-available basis. Cost is $550.00 per person. This unique air service is for the adventurous traveler who wants to follow the Iditarod mushers all the way to Nome. This charter affords you the opportunity to personally talk to the Iditarod mushers, personally see and experience nearly 1000 miles of the Iditarod Trail across the Last Frontier and visit various Native Alaskan villages and cultures. The charter rate for up to 2 passengers and gear for this up to 10 day adventure of a lifetime is $15,000, $5,000 each additional passenger.. Contact Sheldon Air Service with details of your 'Bucket List' team and we will craft you a personal Iditarod agenda to experience the Last Great Race to suit your desires.